Since the first time I had Ludobites back in June, I knew Chef 'Ludo' was not like the rest. Put aside his deviant french-fangled approach to food for a bit, I'm talking about his mere dedication to food that got him to where he is now. It was visible even at that same dinner, asking ever so humbly if I could teach him how to properly make a simple Quesadilla after watching him get the boot from Top Chef Masters live, for a failed attempt at a "Pig Ear Quesadilla" in which he stuffed with Monterey Jack, Pinto Beans, Aleppo Peppers, Smoked Paprika, Chili Powder, Green Onions and served with Lime-Mint Aioli--interesting but...really? Where others would have been satisfied with recipe versions of this dish, Ludo wanted to take in the experience of it all, he wanted to FULLY comprehend the concept of Mole, how it was made traditionally in my family...from point A to point EAT. Sooner than I knew it, he was outside my house in East LA at 10:00 AM sharp and we were off to the local Tortilleria and Top Valu Super Market to stock up on the 15+ ingredients needed. He had already brought the protein, a fine young Diestel Guajolote (Turkey), the original pre-conquest protein for the famed dish. My mom is from Yerbabuena, Zacatecas--a desert, ranch-village in between Valparaiso and Fresnillo known for my Aunt's Queso Añejo Enchilado, a raw, hard rind stinky cheese that is dunked in a red Chile de Arbol sauce. To date, there are about seven families in total living there with ours being one of them. In addition, I had also suggested that we teach Ludo Pipian to contrast with the sweet and savory Mole. Pipian is a more minimalist but still complex, entirely-savory sauce made up of unhulled toasted Northern Pumpkin seeds, almonds and Cumin, it is more common amongst meals than the extremely labor intensive Mole, which is traditionally only seen Weddings, Quinceañeras, parties etc. We first started with the personal de-seeding and de-veining of every single one of the chilies. Equal portions of Chile California and Chile Nuevo Mexico are the base of the sauce, California adds flavor, Nuevo Mexico adds heat. Second up is Chile Ancho (aka Guajillo), its raisin-like flesh adds exquisite texture and lends that signature dark crimson hue. A moderate amount Chile Chipotle adds a shadowing heat. And the Chile de Arbol is added lastly according to personal tolerance to fire, with it's instant dry, lip singe-ing heat. Next was the frying of the nuts and spices: Almonds, Peanuts, Sesame Seeds, Anise, Cinnamon, Clove for the Mole. And just Cumin, Almonds and Pumpkin Seeds for the Pipian. Blending all this batch-by-batch was a fatal task for my sister's Cuisineart blender, plastic gear underneath the blade actually melting completely off due to the extensive use of it through out the cooking process! 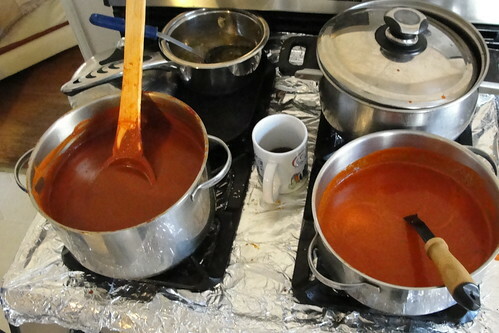 For Ludo's sake, my mom decided to strain both sauces for a luxurious, smooth, velvety sheen but otherwise, we would of traditionally sufficed for a little more rustic texture in honor of not wasting ANY of the ingredients. Crimson Red Mole and Opaque Orange Pipian. 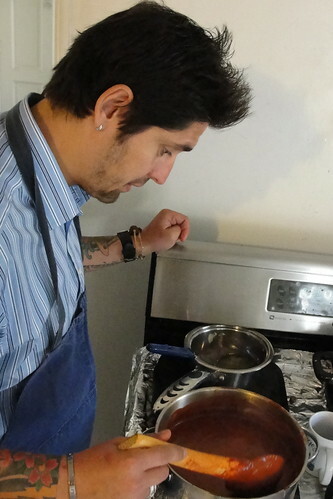 Of course, both of the sauce's flavors were allowed to fully transpire with the aid of freshly rendered Manteca (lard). After six hours of labor and about an hour of the final brews simmering and allowing the flavors to gain depth, I could tell Ludo was eager as ever to fully experience Mole and Pipian Zacatecano in all its bounty with its time-honored sides: Garlic-Tomato Fried Arrozito and crisp-tender marinated Nopalitos (cactus). 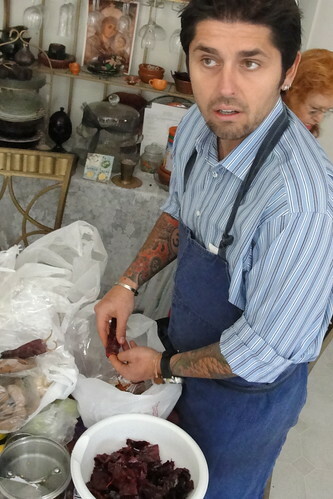 All and all, it was an absolute pleasure to share a piece of my rich edible heritage with Chef Ludo...and to watch him swoon to my mom's and my cooking. What a wonderful read and even more exciting moment to share with your mom! Fantastic! I hope we get to taste at Ludo Bites! 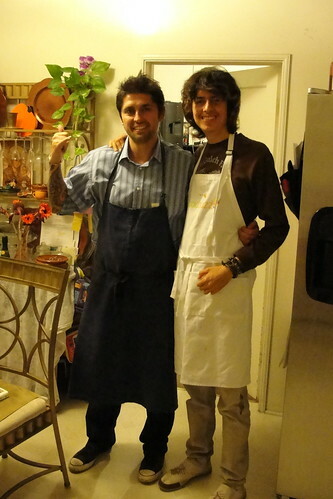 I love chef Ludo as well as Mole. This was a great story. I like your writing style. Do you have the recipe. I've made mole a few times and usually have to use several recipes to get what I want. Your family's recipe sounds fantastic just by the ingredients alone. Thank you for sharing your experience. What an incredible experience for both your family and for Ludo!! Wow! Good times, Jav! Can't wait to see how this translates to Ludo Bites 3.0. Bet it's gonna be awesome. Muy lindo Post!... home cooking from our grandmas and mamas are the best aren't they? The food looks amazing!!! Thanks for sharing this awesome experience! I really enjoyed the write up! And the food looks so good! *drool! Nice post. Looks like veryone had fun and good food as well. Good job of capturing what was a no-doubt awesome experience. That's great that you got to share your family's food and passion with Ludo. I'll be on the lookout for mole on the LudoBites menu in December. yikes about your sis' blender! But looks like you guys had a blast and I can't wait to see what Ludo will use it for. that's a great photo of Ludo haha. no recipe for us readers? Dios mio de mi vida, Javier! I saw the episode with you and Andrew Zimmern, and guess what, muchachito, blogging about food must run through our veins, because my parents are Zacatecanos, too! 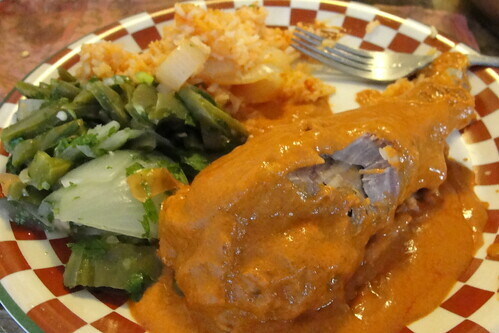 With just a few variations, my mother made mole just like your mom's. The only reason why I haven't posted the recipe is because of my sisters. For them, giving away the recipe is like giving away the family jewels, but I think that I will declare to the world that a simple mole a lo zacatecano is nothing short of delicioso. Cuidate, y un fuerte saludo to your madrecita, and to you, of course! "A Little Cup of Mexican Hot Chocolate"
Going to the source! 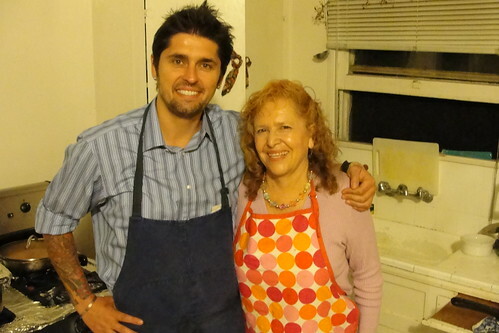 Great story, what an honor to tap into your family's heritage and kitchen! Awesome stuff Javier! Great job with the mole Ludo. 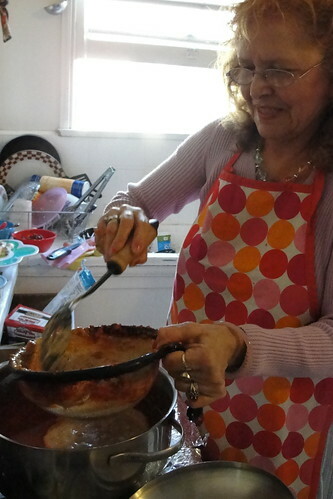 And we must not forgot, Javier's mom for her awesome cooking skills! Fabulous post and so glad that you were able to share your information!! And then that we are able to partake at LudoBites! This is a really sweet post. Great story, Javier!